Plot: A headhunter whose life revolves around closing deals in a survival-of-the-fittest boiler room, battles his top rival for control of their job placement company -- his dream of owning the company clashing with the needs of his family. Starring: Alison Brie, Gerard Butler, Kathleen Munroe, Maxwell Jenkins. 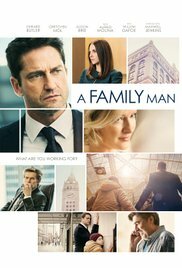 distributed by Vertical Entertainment «A Family Man» in the US movie theaters released on July 28, 2017; dvd and blu-ray release date was set for August 29, 2017. Rent from Netflix and Redbox from August 29, 2017. «A Family Man» in the UK released in movie theaters on June 5, 2017. The movie released on dvd and blu-ray on July 3, 2017.